Whether you’re watching the match at home with family, or looking for a healthy snack to bring to Croker - check out our great recipes from Cork legend Juliet Murphy! Scatter the spinach leaves onto a large platter. 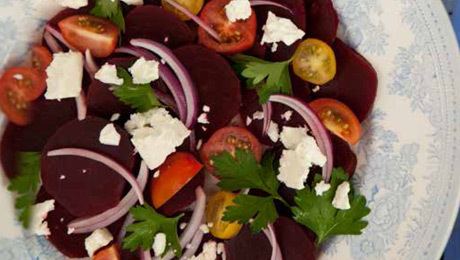 Slice the beetroot into wedges and arrange on top of the spinach. Scatter over the feta, mint, spring onions and chilli. To make the dressing, put the oil, honey, lemon juice and mustard in a glass jar with a lid. Season and shake well. When ready to serve, pour the dressing over the salad and toss lightly to combine.